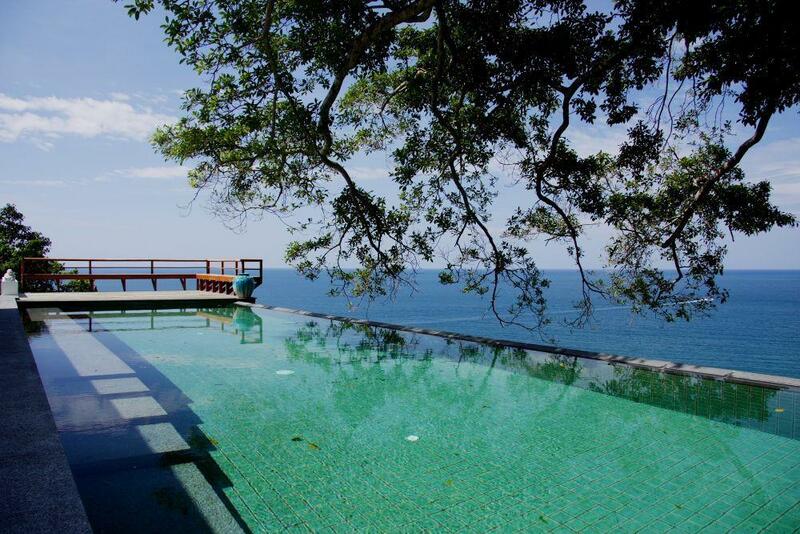 This impressive 4 bedroom, 4 bathroom villa is located on a headland between beautiful Surin and Laemsingh Beaches. 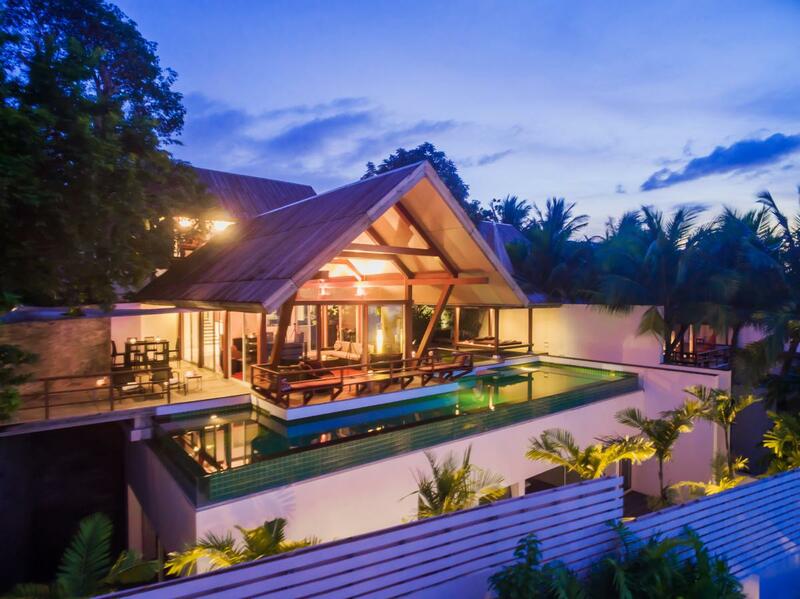 The villa is one of five exclusively designed properties in a secure gated private development. Decoration and design is contemporary modern Thai and the living accommodation features a blend of solid wood and terrazzo flooring while black fired-slate is used extensively in the bathrooms. 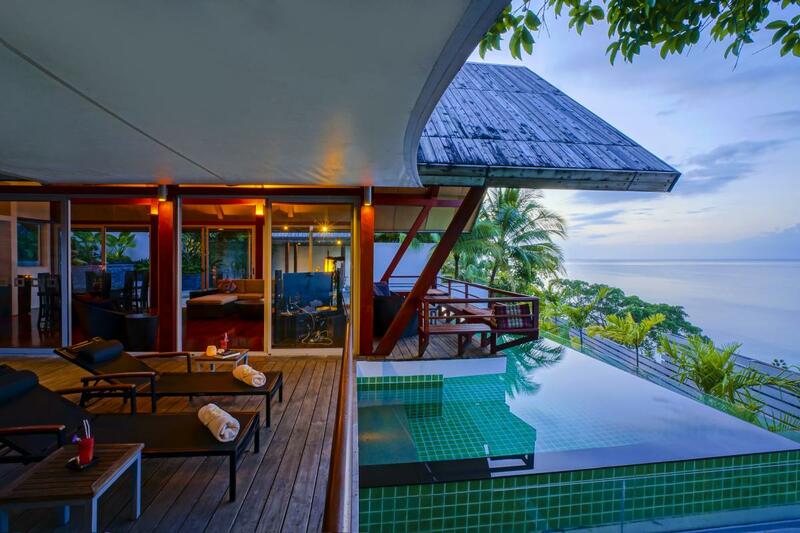 Guests will feel comfortable and welcome with the villa's amenities. 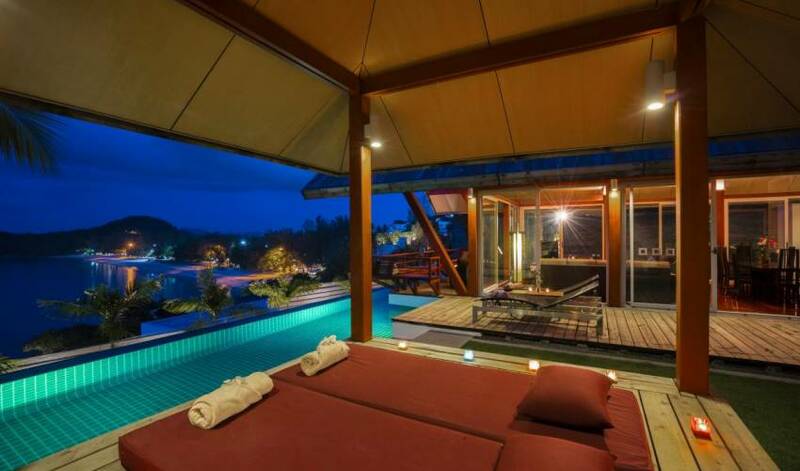 It is laid out on 3 levels and offers a wide spectrum of accommodation. There is adequate space to comfortably sleep and cater for 8 adults with an internal area of 550 Sq metres (5,900 sq ft), and a further 550 Sq metres of terracing, gardens and balconies. 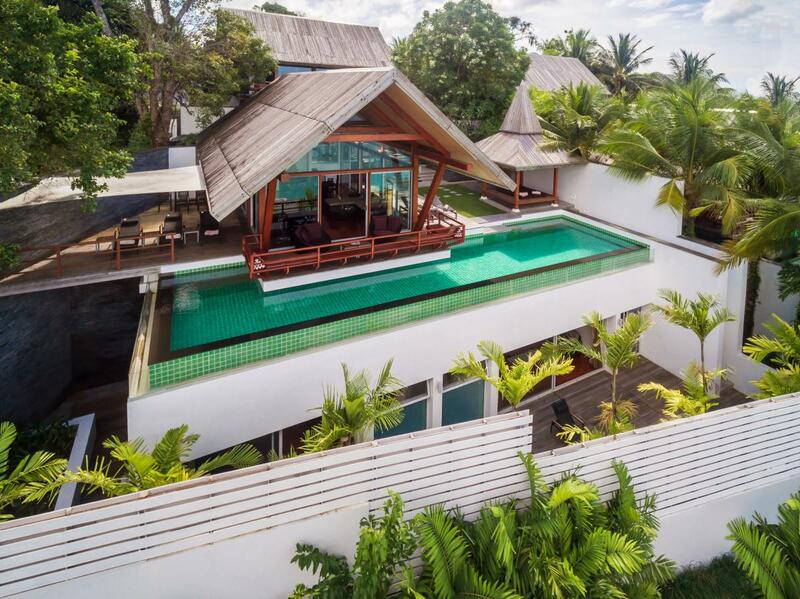 The outside terraced areas feature a pond and an 18-metre long L-shaped infinity pool with a Sala for relaxing or having that outdoor massage. There is adequate room for sunbathing and relaxing on the terraces where the eaves of the roof provide shade if required. 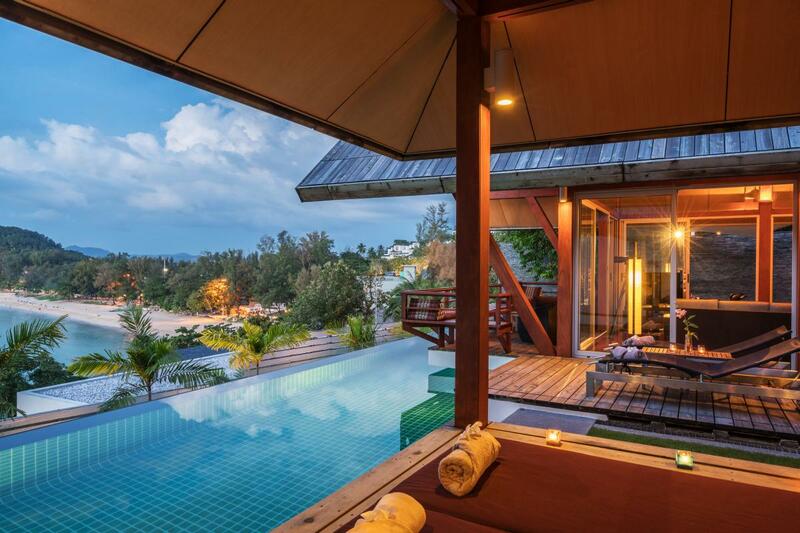 The living room has a spectacular view of Surin Bay and Beach and features a balcony the full width of the room – great for sharing sundowners. There is also an outdoor dining area with shade – ideal for breakfasts or outdoor dining. 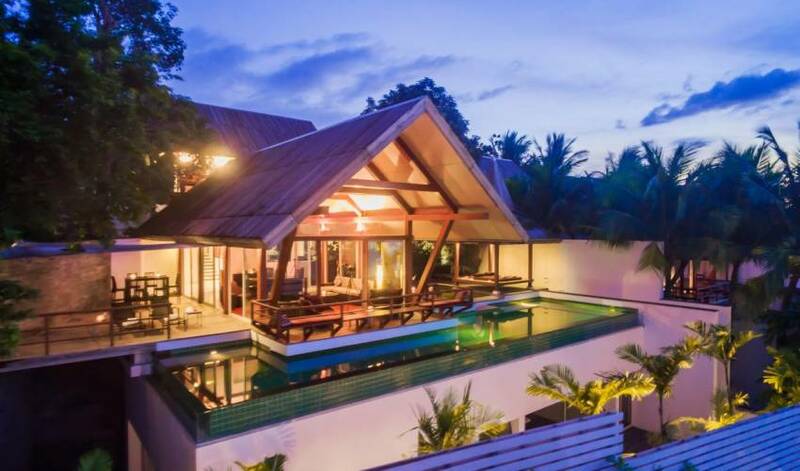 Located on a headland at the southern end of Surin Beach on Phuket’s NorthWestern Coast, the villa has unrivalled views over the Andaman Sea, Surin bay and its magnificent beach. 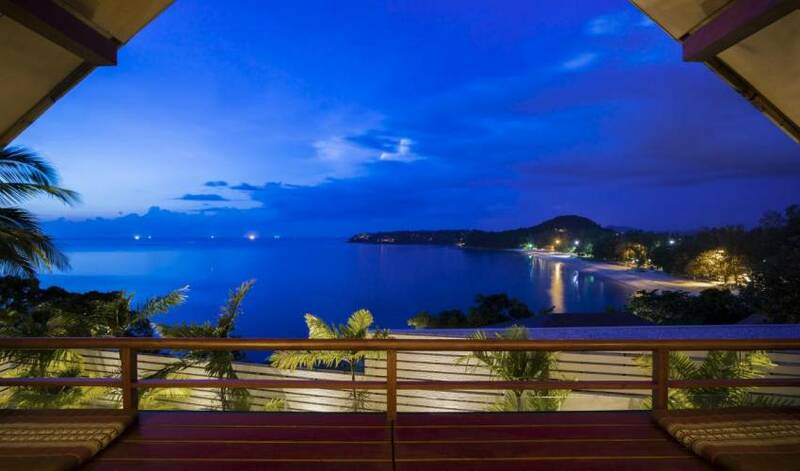 Surin Beach and Laemsingh Beach are both less than a 10-minute walk and Phuket International Airport 30 Minutes away and the town of Patong about 25 minutes. A wooden spiral staircase leads to the spacious top level Master Suite that includes a comfortable sitting area, and a small office area. The bathroom features a large hand-made terrazzo bath and a separate shower. 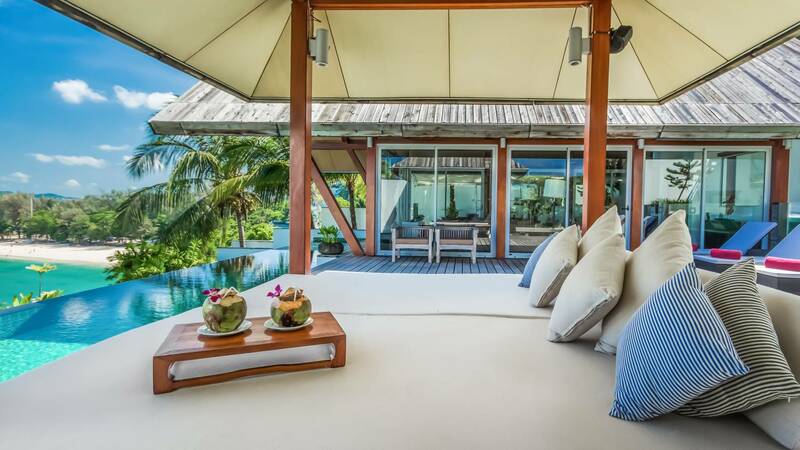 There is a 10-metre private sun-deck spanning the width of the room for relaxing. 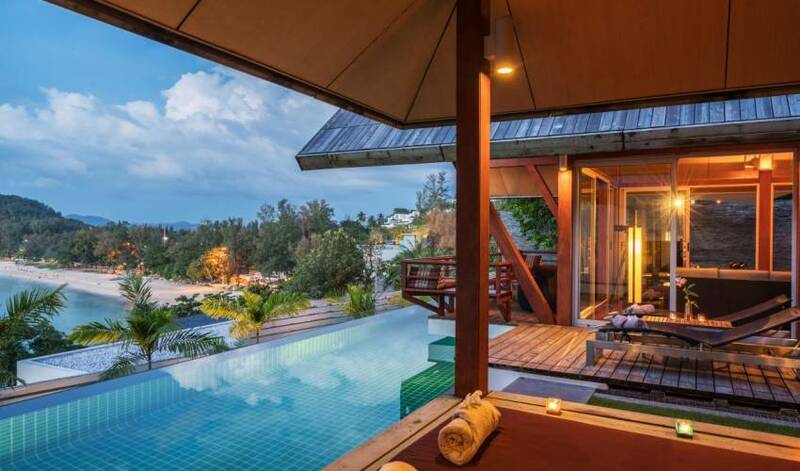 However, the greatest aspect of this suite is the view of Surin Bay and Beach that greets you when awake in the morning and the remote controlled electric blinds are raised. 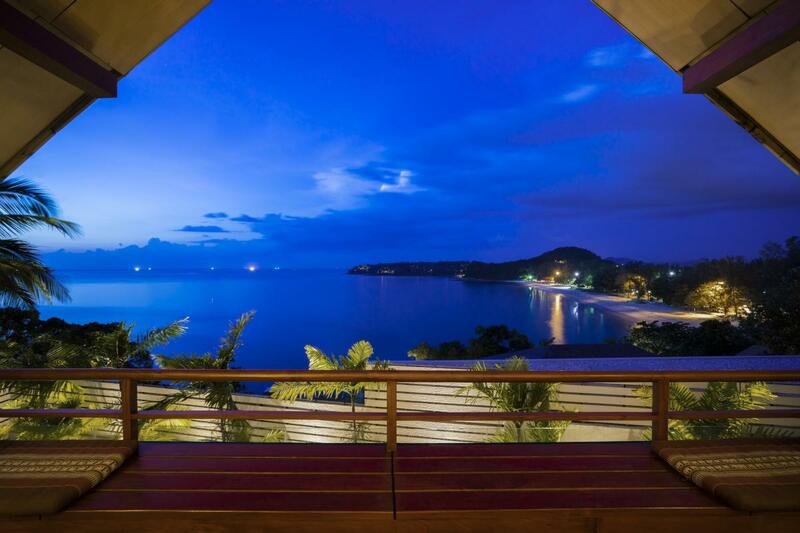 The guest suite is located on the main level, and also features the view of Surin Bay. 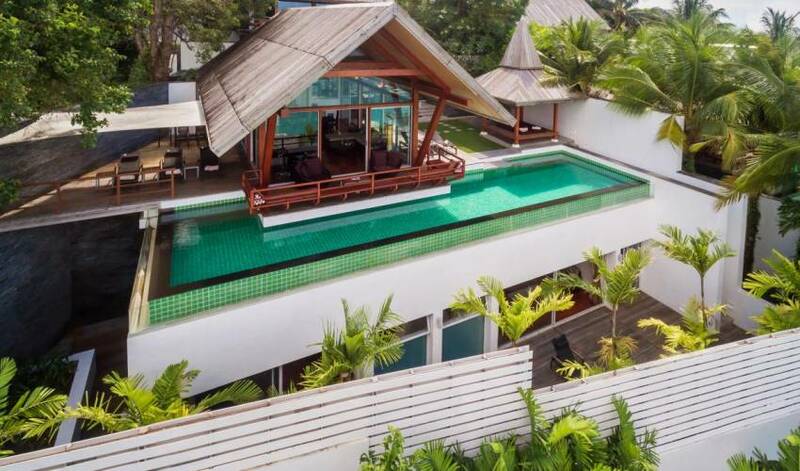 The sliding doors open onto a large terrace where you can access the pool and the outdoor Sala. The bathroom features twin wash basins and a separate sunken bath and shower. 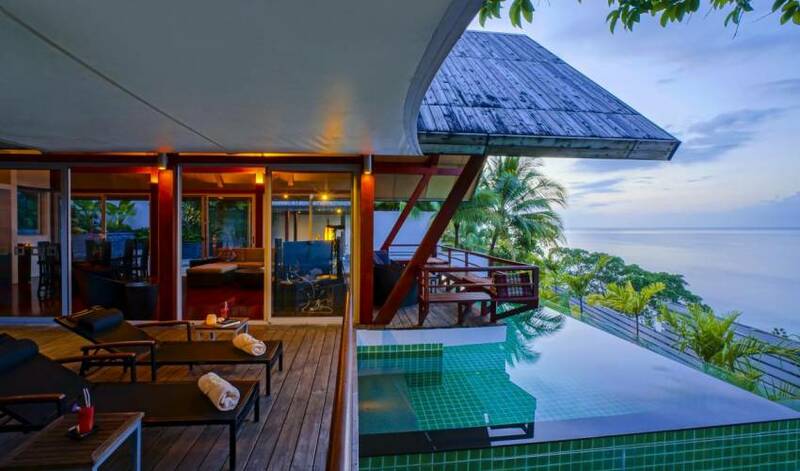 The main living and dining room also share the magnificent view of Surin bay and beach and there are several terraces and balconies leading off from this room that allows you to enjoy al-fresco dining. There is an 8 seater dining table inside the room and a bar table on the terrace that features an awning to keep the sun off while dining. A quality Sonos sound system allows you to play music files directly from your SmartPhone or Laptop and the 55” Smart TV has to surround sound with cosy chairs around to relax on. Villa staff can prepare a variety of Thai food to satisfy your taste buds. The lower level features a secluded walled garden and decking where the remaining two bedrooms and gym are located. The gym has running and elliptical exercise machines. This level offers guests complete privacy and is populated by a variety of trees and plants. All bedrooms are large, have king-sized beds, their own en-suite facilities with shower (and baths in rooms 1 and 2) substantial built-in wardrobes and sun-decks or balconies. There is a music system in every room allowing you to dock and charge your smartphone and play music. There are adequate sunbeds scattered over the balconies and terraces of the villa. 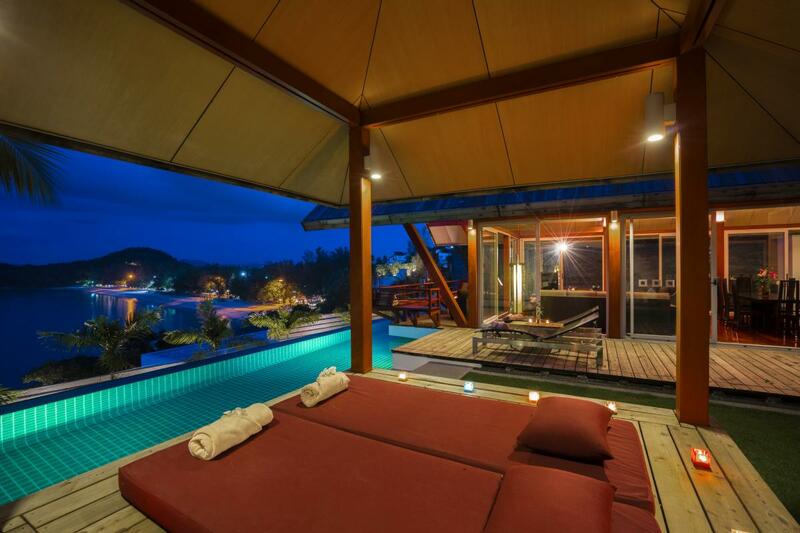 All rooms in the villa have their own individually controlled air-conditioning. At the entrance to the villa, there is a carport/garage suitable for 2 large vehicles. The maids quarters are adjacent to the garage port and are outside of the villa, servicing guests yet providing complete privacy in the villa when required. The large Italian designed kitchen features state of the art appliances with granite work-surfaces. Should it be required the development has its own emergency power supply in case of mains power failure. The generator is capable of maintaining full services including air conditioning should this occur. There is also a safe in every bedroom and 24-hour security guards on the development. Both of the local beaches Laemsingh and Surin offer great casual dining, and Surin itself provides a small but select assortment of restaurants and bars including Catch Beach Club. 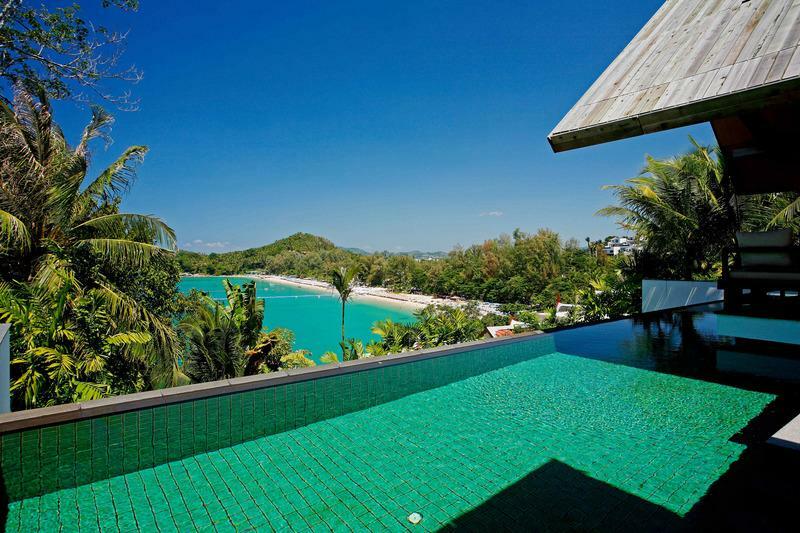 You will not have to leave the area to be entertained and enjoy fine cuisine, champagne brunches and the best of Phuket’s Spa’s. Surin is host to some of the most exclusive hotels and restaurants on the island – Amanpuri resort and The Surin are both 5 minutes drive from the Villa. If you just want to chill there are some laid-back restaurants and bars on both beaches. For a night on the town, Patong is 25 minutes away from where you can literally party-all-night if the mood takes you. We look forward to welcoming you to Laemsingh. 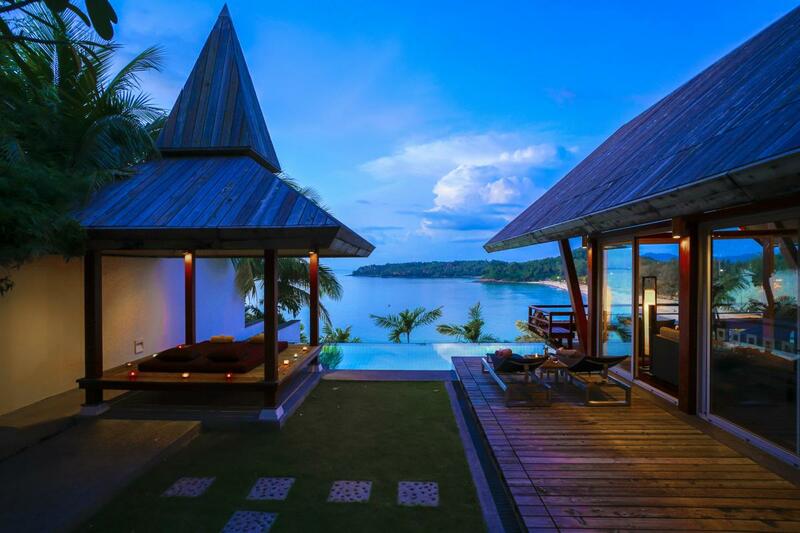 As soon as you walk into the villa, you are taken by the beauty, serenity, and magnificence of the beach view. The villa is decorated with such warmth and comfort that you feel right at home. Every details and amenities have been carefully and crafted so that you will be amazed and never want to leave. The location is simply perfect for those beach lovers since it is a very short walk from the villa. At night when it is calm and people are out, you see the night life come alive before your eyes. We enjoyed a nightly fireworks and beautiful lanterns being celebrated. It really is unique and fun for us and our children to see. Besides all the wonderful amenities that we enjoyed so much at the villa, the staff was absolutely amazing. The head chef Too and her assistant definitely aimed to please us in every way possible. She can cook anything your hearts desire. What amazing meals we ate and experienced the true Thai culture through her cooking. It is hard to say what we liked the best because the villa, the food, the beaches, the location, and did I mention the food...simply the best! Would definitely come back again! Also Villa Getaways were just fantastic. They really went above and beyond to accommodate and ensure that we were happy customers. We will definitely use them again for other vacation spots. Big thanks to Kris and Tan for all their help in making this trip a vacation we will never forget.